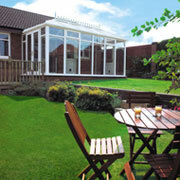 See our image gallery for more interior and exterior conservatory pictures. Check out just a small selection of our range. More styles are available on request. See our gallery for more interior and exterior conservatory pictures. When you look through our range of bespoke Conservatories in this website you will see they are beautifully built, durable and long-lasting, our fantastic range of conservatories can be fully customised to complement the look of your house and the garden space available. We will happily visit you and access the positioning and building requirements for your new investment to your property. When creating your conservatory there are so many variables that need to be taken into account, such as size, style, survey results, positioning and planning permissions, it would be impossible to quote you accurately without visiting your home. Glazing requirements meet all the standard ruling for safety set out by the building control departments with safety glass as standard and can incorporate Georgian bar and leaded effect depending on your taste. We will happily manage your conservatory installation from start to finish including all the building works and footings required. So because your needs and the specifications of your home are unique, your price will be too. We will never promise to be the cheapest but we will be the best. All of our conservatories come with our comprehensive 10 year guarantee as standard.